So, i’m an instagram addict. That’s probably not surprising because of my love affair with photos, fashion and shoes. 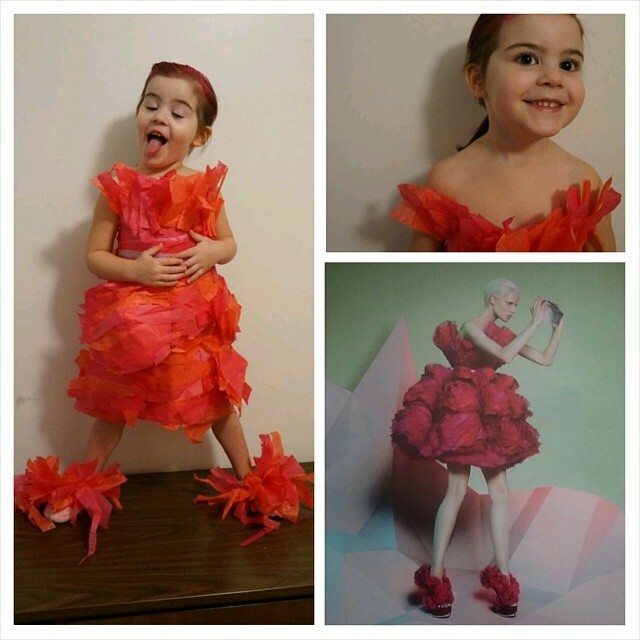 My most recent muse, Jacqueline Harbin, writer of The Polka-Dotted Truth posted an image on her feed of an adorable little girl in an amazingly constructed paper gown mock version of a designer gown. Everyone in the world who wasn’t living under my oblivious rock knows the girl as “Mayhem” and the fun blog #FashionByMayhem. Its a fantastic inspiration of something amazingly fun and easy to do with you kids. This is why the internet is great. Us SAHMs have pinned 1001 crafts that we want to do with our kids but they are generally short lived boring painting projects, cookie cutter instructables to get similar or failed results. I love these #fashionbymayhem and #inspiredbymayhem posts because more than anything it sparks an idea, and generally you don’t need to go to the craft store because you already have paper, tape and scissors. The first dress we made literally took five minutes. And it made her feel like a princess. Which really made me wonder why haven’t i done this before. It was so incredibly easy to make her really happy. Some girls may not be easy to please but this girl loves princesses, dresses, and shoes. 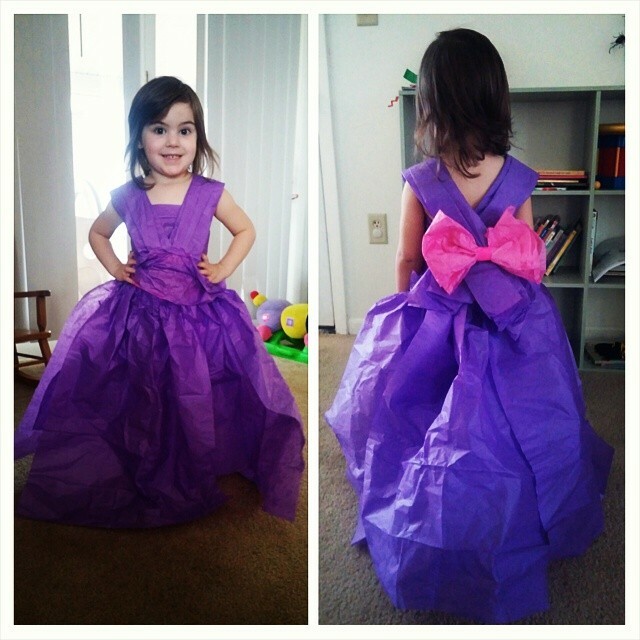 Our first and easiest dress. the Vanity Fair: A black and white dress made from the black and white images found in the Sept 2012 issue of Vanity Fair. This one was more my idea than hers but she loved tearing pages from the magazine. and she loved the shredded skirt. This is the one she chose and the most difficult so far. An Alexander McQueen dress in Vanity Fair and as one of my followers pointed out an Effie Trinket piece from Catching Fire. Her favorite part of this was the shoes. The fun thing about paper is that it is noisy. She liked hearing the paper sounds as she walked and kicked her feet around. 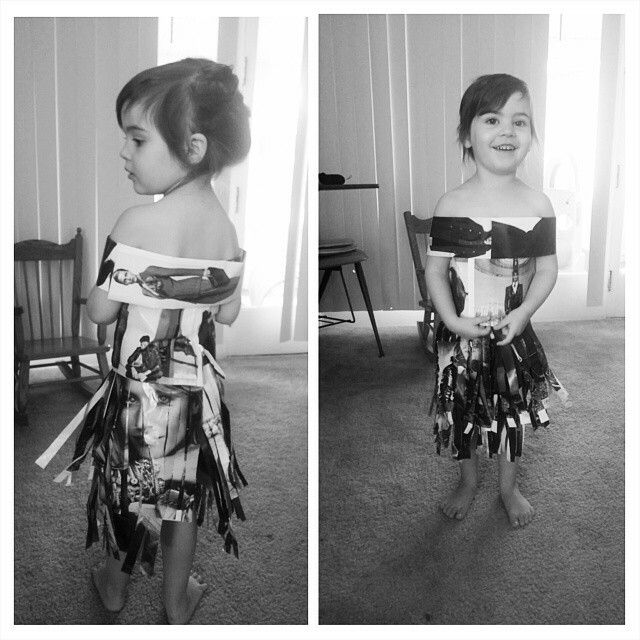 The Catching Fire dress we made yesterday was the most time consuming. We tore a pack of red and pink tissue paper. We made a shell out of white paper and used a glue stick to put the strips on the dress with no rhyme or reason just trying to get somewhat close to the image. While i tried to make the skirt wavy we ended up taping little cup like humps to the dress and then putting strips over them. And for the shoes, we took Cs crocs and just made little bundles of left over strips and taped them to her shoes. The girl in the photo had slick back blonde hair so we used our pink spray left over from Halloween and had matching slick back pink hair. I am so thankful I found this interactive creative outlet. Now I need to figure out how to do the paper tuxedos for my son. 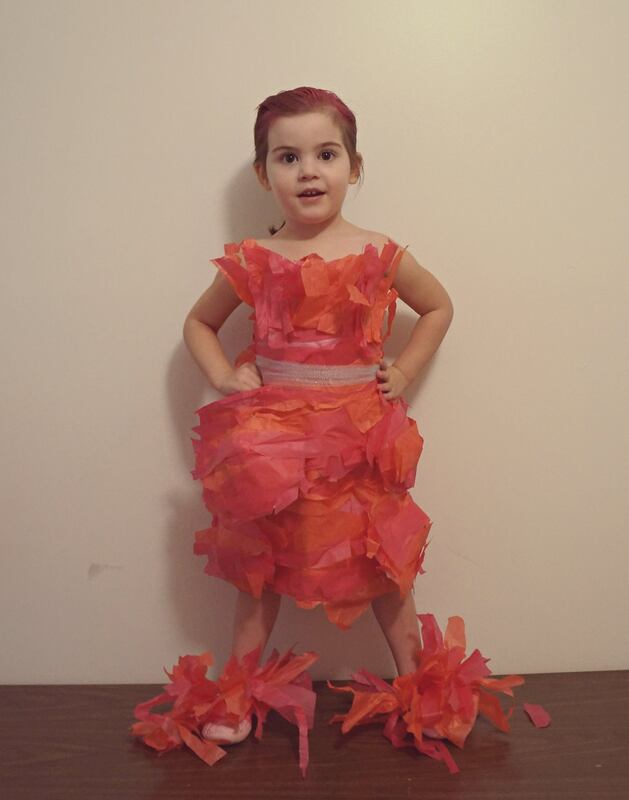 Thanks to Mayhem and her Mom for sharing their at home fun and inspiring creativity.